I received some days ago the flag of Giglio Island in the Mediterranean Sea. In conmemoration of the 200 aniversary of the last Berberic attack to Christian lands (precisely to Giglio island on 18 November 1789) that ended in a hard defeat of the North Africains, was create the flag of Giglio. Flag was first hoisted 18-11-1999 on a tower in the wall of Giglio Castello. Giglio is a wonderful island in front of the coast of Tuscany. It is part of the "arcipelago toscano", whose best known island is Elba (at least after Napoleon ruled a state over there). I was there in July 1999 and I had the chance to observe two different Gonfalone both used by Giglio Castello. I interviewed the guardian (usually the guy best informed in practice matters...) and he explained me that one was the older gonfalone that during a restoring period was substituted by a new one, different, and then reintroduced again. It is a mess, also because both are not officially recognised! 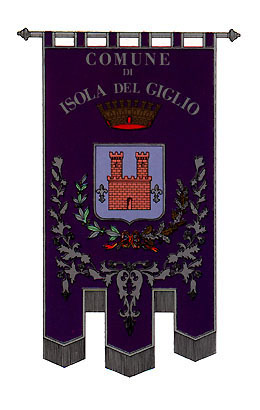 Isola del Giglio - commune in Grosseto Province, Tuscany, near Elba Island . There is another gonfalone at http://www.gol.grosseto.it/puam/comuni/comune12.htm.